Dias & Co. Garage, Lowther Street, Carlisle in the 1920s. Homepage. This page: Record of a Morris Cowley car sold to a customer in Cockermouth, 1924. A Morris Cowley sale at Dias & Co., The Garage, Carlisle. This unassuming piece of paper recalls a moment in time on 4th October 1924, when a gent from 3 Elm Terrace in Cockermouth, left a deposit on a Morris Cowley. The supplying garage was Dias & Co., of The Garage, 53 Lowther Street, Carlisle. Whether the car was new or used isn't recorded sadly. Elm Terrace probably actually refers to Elm Tree Terrace in Cockermouth. As for the garage itself on Lowther Street in Carlisle, number 53 is listed as being home to a betting shop now. Interestingly, the modern-day Argos store just a short distance away on the same street looks like it was a garage in the 1930s. There's a scribbled date, written in pencil, on the receipt which may well refer to the date that the car was actually delivered (2nd December). The 1924 date confirms that the Cowley would have been of the "bullnose" variety, as the flat-rad version would come along a couple of years later, in 1926. Period photos of various bullnose Morrises may be found on this page, here on OCC. 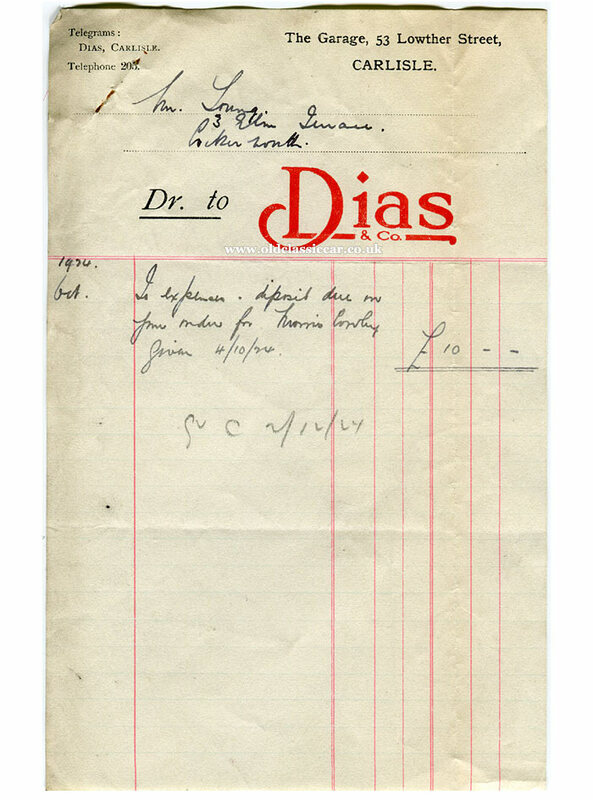 More interesting old items of motoring paperwork, many of which relate to garages in the 1920s and 1930s, can be found in the Motoring Collectables section.